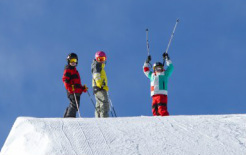 Our Kids Ski Packages are a great way to get your kids on the slopes this winter. Our Trade In Program allows you to purchase a ski, use it for two years, and then return it for a credit when it's time to jump up a size. We have plenty of options for you but here are a few examples. All package prices include mounting bindings.